Hello Ghoulies,its friday the start of the Halloween Weekend. Make sure you have fun this weekend, find a costume contest get out there and don’t be a party pooper this year! Scare your friends scare your neighbors 😀 The weather has been wicked the past few days here in NY and we have already have seen snow…UGH!! Lets cross our fingers for clear cool crisp weather over the weekend through Monday night!I’m going to be a veryold wacky witch for halloween and yes i will post pictures 🙂 What will you be? PRINTS PRINTS PRINTS ….OHH and more Prints! OOOH Halloween is right at your front door!! Is everyone getting excited? Do you have your costumes picked out? Halloween Parties,zombie crawls,anyone attending any Vampire Balls? Tonight i will be crawling out to The Village Invasion Hosted by Captain Cruella in Saugerties, NY. Should be a Ghouly Good time. Anyone that goes be sure to dress in your bloodiest attire as there will be prizes for all sorts of zombies. Including some of my Spooky Prints. So get your carcus out and about and have some FUN!! Halloween has creeped up so fast its GREAT!! I have been enjoying all of the Horror Movie madness on the television. Although I have been waking up very early mornings it kinda stinks when you fall asleep very early while watching Great Horror classics like the Shinning!! I am still having difficulties updating my albums here on my website. The webmaster is workong with me on this problem. 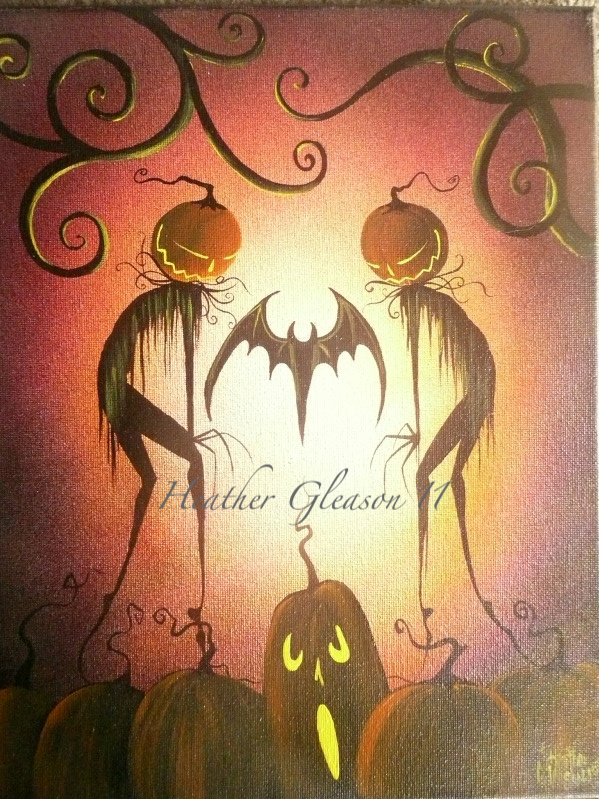 Your best bet is to find me on facebook “My Eclectic Mind” the art of Heather Gleason or on Ebay. Ebay you can view up to date art that is for sale. I will be posting 3 day auctions for the few weeks so everyone can get their art before Hallween decorationg and gift giving!! November i will be attending some smaller local shows here in the Hudson Valley. I will post those events as soon as they become permanent. I will have Holiday themed pieces. NEW PRINTS, original paintings,Witch hats, ornies,Boxes,Small Dolls. All in time for Christmas. I will keep you updated HERE! 🙂 Well its back to creating I will chat with you soon!! !